1. Reading revitalize your brain waves : Rather than watching TV which is just a visual activity, I recommend that you guys started reading something. Reading is an exercise that makes your brain stronger. A person reading a book thinks more and is smarter than others. 2. Develop your skill in an easy and have fun : No matter what your interests are, you can find plenty of books on them. 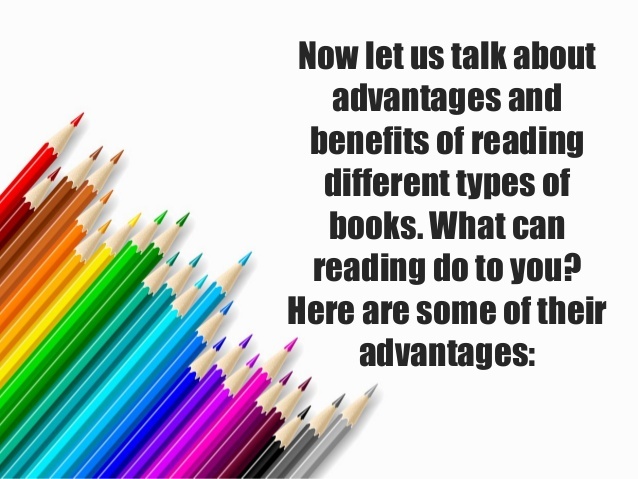 Reading books regularly can help you gain knowledge on your desired topic, be it sports, designing or literature. 3. 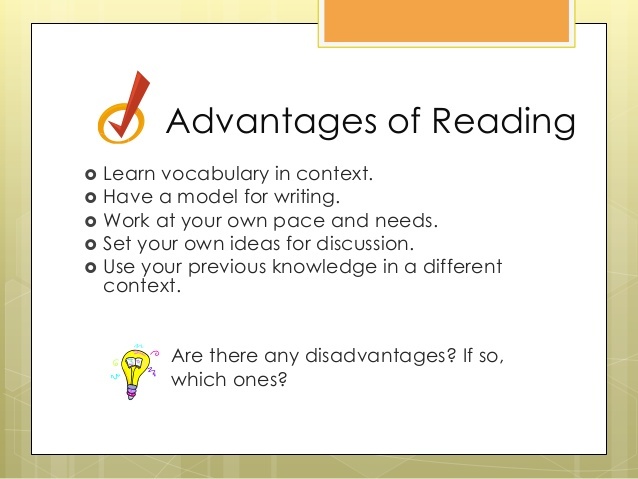 Improve your vocabulary : Continuous reading can help you improve your diction, grammar and vocabulary. It can make you more confident about a particular language and improve your fluency. 4. Knowing about the world : Reading improves your imagination. It takes you to different eras, places, culturals and lets you understand the world. It makes you an intelligent individual. 5. Improves your concentration level : You may have seen people reading at bus stops, gardens, train station etc. When you are reading, you put your entire attention into that book. You try not to get bothered by your surrounding. This helps in optimizing your concentration level. 6. Boosting self-esteem : It is seen that a person who read good quality books have more information on dealing with situations. These individuals have a great knowledge about the current happens and can have conversation with anybody. This is the reason why students are made to read books in front of the entire class. 7. Improves your memory : Researchers say the reading activities such as “Crossword” helps you in stretching your memory muscles. Therefore, many doctors recommend these activities to their patients as an experience to their condition. 8. Improves your personality : It is notices that bookworms (Book readers) are well organised and disciplined individuals as compared to others. 9. Read 24 x7 anywhere at anytime : You can read a book anytime and anywhere. It is a perfect way to entertain yourself when you get bored during travelling. 10. Attain peace and satisfaction : Reading is an activity that allows you to attain great comfort, satisfaction and peace. These are some of the benefits of being an elite reader. Hope that this post inspired you to read. This entry was posted in Travel and tagged advantages of reading books. Bookmark the permalink.